As one of my favorite winter species, the American and hickory shad conduct their first spawning runs in our region of the St Johns River from January thru April. American shad are one of a few species of fish living their lives in the ocean and then return to the area they were hatched to spawn again. The American shad make these same spawning runs on every major river on America’s east coast, but they spawn in our region first due to water temperature. Averaging around three pounds, the American shad are a very feisty hard pulling and jumping species of fish, and they are great fun on both ultra light spin and fly tackle. 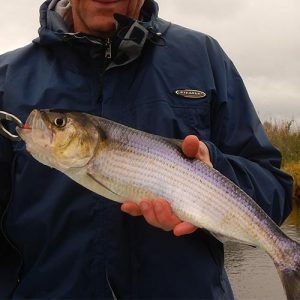 American shad fishing in our region of the St Johns River is as close to the stream fishing anglers enjoy in the northeast and northwestern rivers of America. When the run is at its peak, anglers can catch between 20 and 50 fish a day. For fly anglers, a five weight fly rod and both floating line and a sinking tippet are recommended using either small Crazy Charlie of Clouser style flies in bright colors is recommended.